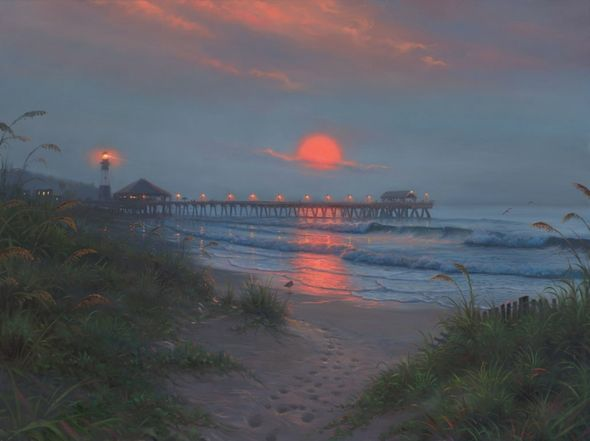 Mark Keathley Hand Signed and Numbered Limited Edition Embellished Canvas Giclee:"Solitude"
Edition Size: Artist Signed and Numbered Limited Edition. Certificate of Authenticity . Limited to 430 Total editions. Image Dimensions: 18" x 24" , 25" x 34", 30" X 40" and 36" x 48". From the Artist: There is anticipation each time I head towards the ocean. Especially when I see some glimpses of a radiant sky through the buildings, or trees. I can't wait to get there, "hurry up," I'm thinking or calling to the ones that are slowing me down. "This is going to be good!" is what is on my mind. Light, water, waves, design� it just doesn't get any better than this!